It would appear that the solution for OWN's sagging ratings would be Oprah herself. Although the media mogul was reluctant to have to carry the channel, it would appear that she is the only one that can bring in the ratings well at least until the find something else outside of "Sweetie Pie's". But at the end of the day, my money is still on Oprah. I'm sure she's going to come up with something to turn things around. One does not become a self made billionaire by being stupid. LOS ANGELES (TheWrap.com) - Is there hope for Oprah Winfrey's floundering OWN yet? The two-hour premiere of Winfrey's new series "Oprah's Next Chapter" gave OWN its highest ratings for a Sunday premiere since the network's January 2011 launch weekend, scoring a 1.1 rating in the network's target women 25-54 demographic and 1.1 million total viewers. 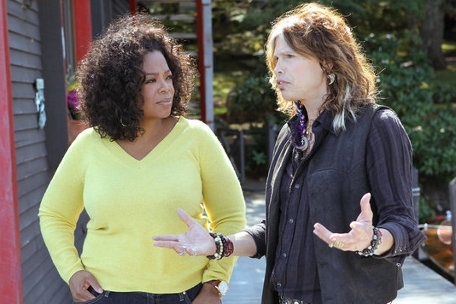 Sunday night's debut of the series, which aired from 9 to 11 p.m., featured Winfrey interviewing Aerosmith rocker-turned-"American Idol" judge Steven Tyler at his Lake Sunapee, N.H., residence. To put Sunday night's numbers in context, the "Oprah's Next Chapter" premiere represented a 463 percent increase in the demo over the network's December 2011 average in that time period. Only the premiere of "Season 25: Oprah Behind the Scenes," which aired on January 1, 2011, has scored better than the "Next Chapter" premiere, drawing a 1.11 in the demo and 1.2 million total viewers. Upcoming episodes of the interview series will find Winfrey touring Skywalker Ranch with "Star Wars" maestro George Lucas, taking part in a slumber party at celebrity cook Paula Deen's estate in Georgia, and visiting Haiti with Sean Penn to survey how the nation is faring since the devastating 2010 earthquake. I think she knew all along that she would have to have an on-screen presence. Plus I think she enjoys what she does. It was just time for the rigor of a daily show to end. My biggest critique was that some key shows were not ready to launch when the network launched. And those reality shows have very short seasons. It is real easy to lose an audience without consistent programming. Lastly some of the programming was very heavy. I can only stomach so much of the dark issues of life. I put my money on Oprah as well. There are some definite growing pains. Re-running her shows is good filler. I think her documentary files have some potential. I'm sticking with her.